Savotta Finnish Boarder Patrol Rucksack. Made in Finland. The best med sized, general use backpack ever made?..lots of people think so, and we have worked very hard to get these in. 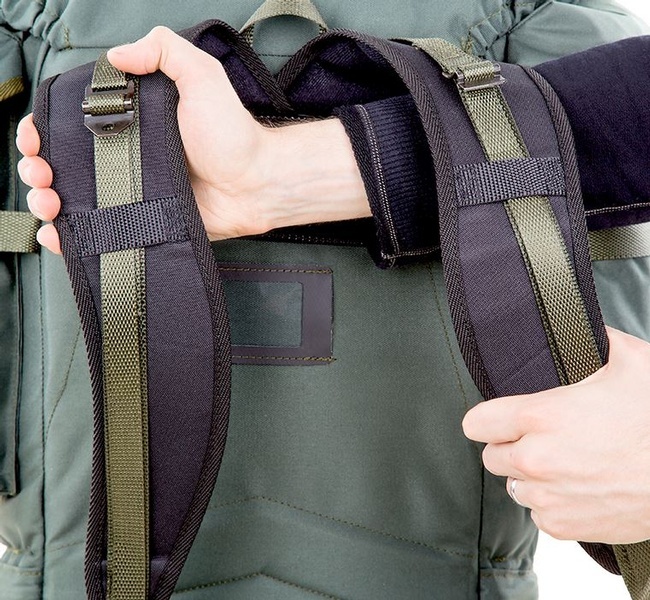 Designed especially for the Finnish Army Border Patrol these are flexible, tough and practical backpacks. Lots and lots of features, aluminium frame, steel buckles, Rifle carry etc etc, so many I have listed them below. These are excellent as short and Med range packs, giving superb supprt, ease of access and durability. A classic from 1989. This is a smaller rucksack designed for the shorter treks of the Finnish Border Guard. An excellent choice due to its size for outings lasting a few days or for shorter hikes. 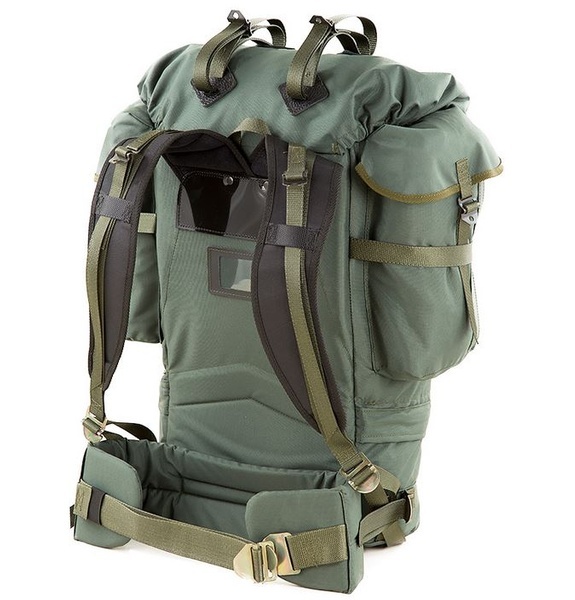 Unlike larger external frame backpacks, the Border Patrol backpack has an internal pipe frame reinforcing the back of the bag. The carrying features of the Border Patrol backpack are perfectly fine for carrying even large and heavy loads. 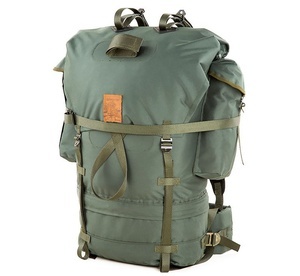 The Border Patrol backpack is something between a normal large backpack and a rucksack. As a special feature, the Border Patrol backpack has attachment points for a rifle on the outside. Originally designed for carrying an assault rifle, the attachment points can very well also be used to attach, for example, a camera tripod or other long special supplies. The top main compartment (dimensions approximately 45 x 35 x 22 cm) is closed by tightening the drawstring opening which is secured with a waterproof protective collar which enables overpacking as well. The opening is covered with a large flap which is secured with straps. The generous length of the straps provides a lot of space under the flap for overpacking. There is a large, open pouch pocket inside the flap. When the flap is closed, the opening of the pocket faces upwards and tightens shut so that the contents will not fall. Against the back inside the bag, there is a compartment the size of the whole back for the support frame of the backpack. The compartment is also ideal for carrying, for example, a hydration bladder or other flat items. The lower compartment of the bag (dimensions approximately 15 x 35 x 20 cm) is closed with a two-way zipper and secured with the same straps used to close the flap of the backpack itself. The side pockets (dimensions approximately 30 x 15 x 6 cm) are closed with waterproof protective collars and covered with flaps that can be secured with straps. The side pocket on the left side also has a vertical zipper through which the contents of the pocket can be accessed quickly. On the flap on the back of the backpack and at the bottom of the bag you can find attachment loops to carry a rifle. The loops are also equally suitable for carrying other exceptionally long pieces of equipment. The load is secured by tightening a strap that encircles the whole backpack. There are attachment points for detachable straps on top of the flap. Large supplies that would not otherwise fit inside the backpack can be tied on top of the flap. The side pocket on the right side is tunnel-shaped and there is an attachment point above it for a detachable strap. This will conveniently hold an axe, for example. The wide, anatomically shaped, sturdy shoulder straps and the well-padded hip belt make for supported and comfortable carrying. 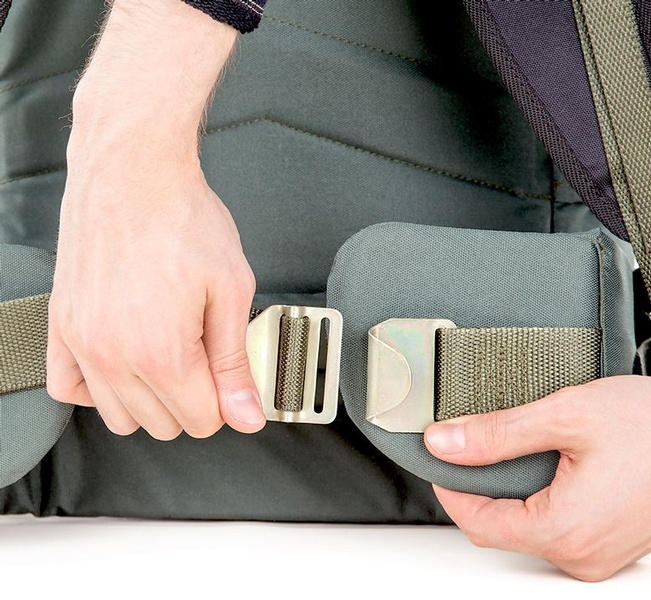 The buckle of the hip belt can be undone very quickly with one hand. A very valuable feature in a possible emergency situation. With the carrying handle on the top, the backpack can be carried easily by hand as well. The back has been reinforced with an internal, square pipe frame made of DUR aluminium. Because of this lightweight frame, the backpack stays upright and is comfortable to carry even with a load that is a bit heavier. The support frame can also be removed from the backpack, if desired. External dimensions: height 65 cm, width 50 cm, depth 25 cm. Materials: PUR polyester, metal buckles and Opti zippers. Purchase through PayPal by using the "Add To Cart" button above or use the form below to order the Savotta Finnish Boarder Patrol Rucksack . Feel free to contact us if you have any questions about the Savotta Finnish Boarder Patrol Rucksack .